national institute of excellence on security, strategy and development studies. National Defence College (NDC) is the premier national institute of excellence on defence, security, strategic and development studies. The college is pursuing its vision since 1999 to emerge as the Centre of Excellence on strategy and development studies to meet the challenges of 21st century. The college provides an in-depth look into strategic issues and constituents of national security of Bangladesh. It endeavours to formulate befitting academic curricula for the potential policy planners, leaders and thinkers from home and abroad. The college allows freedom of expression following a non-attributable policy that allows for an environment of free and open inquiry, exchange of ideas and crystallization of consensus. Distinguished Visitors, welcome! It is indeed my great pleasure to invite you to visit the Official Website of National Defence College (NDC), Bangladesh. 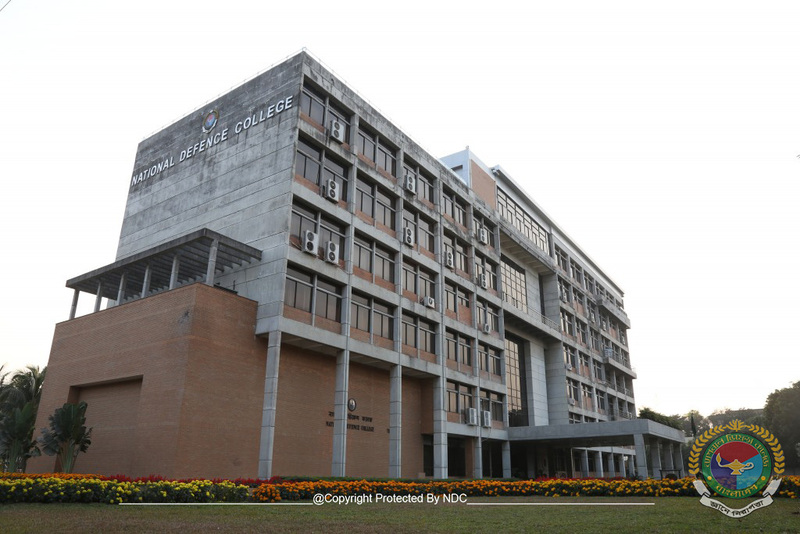 Please take a virtual tour to the most prestigious institution of its kind in Bangladesh.NDC is the premier national institution of Bangladesh for conducting training and research on national security and development issues. 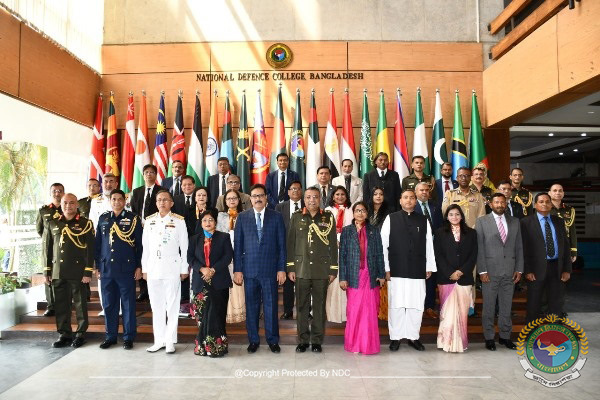 To accomplish this mission, courses at NDC Bangladesh include all subjects and issues that impact or impinge on national security and development. 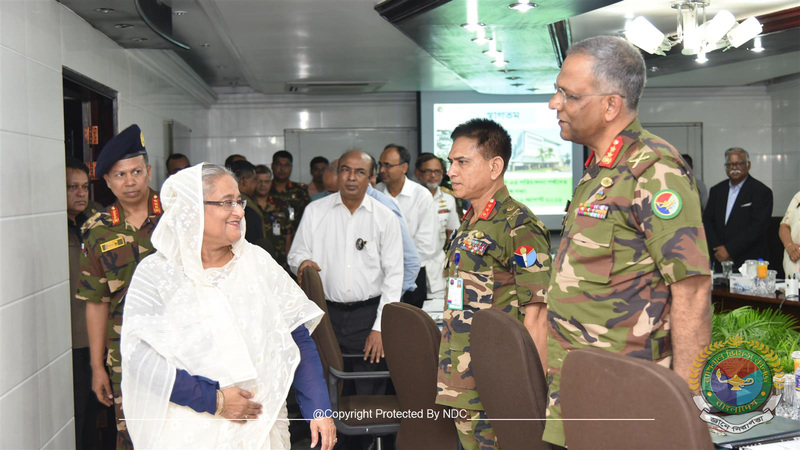 Keeping the people centric orientation of the Armed Forces in view, the Government of Bangladesh decided to establish NDC to contribute directly in national security and development affairs. Accordingly, the Honorable Prime Minister Sheikh Hasina laid the foundation stone of NDC on 10 January 1998. The first National Defence Course commenced on 10 January 1999. Today, NDC continues to provide future decision-makers with the necessary skills and background for filling up the senior positions in the national security and associated fields. Over the past one decade or so, the NDC achieved international prominence. NDC and its graduates are held in high esteem within Bangladesh and around the globe. The NDC alumnis’ achievements are testament to NDC’s commitment to excellence. With a motto “Security Through Knowledge”, the vision of the college is oriented towards its dedication of becoming the premier national institute of excellence dealing with security, strategy and development studies. The college envisages its responsibility to provide a common platform for the participants to understand national security, stimulate strategic analysis and comprehend higher management and decision making encompassing both internal dynamics and the external influences. In this note, courses in NDC are designed to widen the participants’ vision on the regional and the global context in which a nation state operates and the global issues that influence her options in the realm of policy and strategy. These deliver advance knowledge, insight and networks related to national development and security studies among senior policy makers, high ranking civil and military officials and the eminent personalities from different/ segments of the society. As the Commandant of this prestigious institution, I respectfully acknowledge the contribution of our founders and all previous Commandants for their splendid insight and persistent dedication for bringing this institution into a standard of acclamation. The Closing Ceremony of Capstone Course-2019 hold on 10 April 2019. Dr. Dipu Moni, MP, Hon'ble Minister, Ministry of Education graced the occassion as Chief Guest. Commandant, Faculty, Staff Officers and all the Fellows of Capstone Course-2019 attended the ceremony with families. Vice Admiral Sirkant, AVSM, Commandant, National Defence College, India, visited NDC, Bangladesh and call on Commandant, Lt Gen Sheikh Mamun Khaled, SUP, rcds, psc, PhD on 26 February 2019. National Defence Course-2019 visited Ansar and VDP Academy on 20 February 2019. National Defence Course-2019 visited Naval Headquarters ( NHQ) and Air Headquarters on 19 February 2019. Football Match of ND Course 2019 was held 18 February 2019. 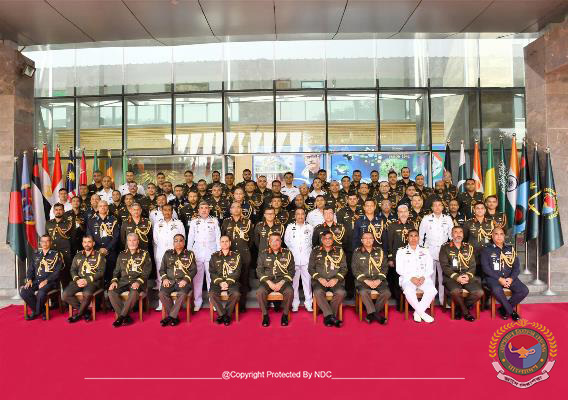 Commandant, Faculty, Staff Officers and Course Members of ND Course 2019 attended the event with Families. Air Chief Marshal Birender Sing Dhanoa, PVSM AVSM YSM VM ADC Indian Air Force delivered a Keynote Speech on 14 February 2019 to ND Course 2019. Ice-Breaking Dinner was held on 06 February 2019. Commandant, Faculty, Staff Officers, all course Members of ND Course and AFWC 2019 along with families attended the programme. Dr. Shirin Sharmin Chowdhury, MP, Hon'ble Speaker, Bangladesh Parliament delivered a lecture on "Constitution, Consituent Assembly and Constitution of Bangladesh" to ND Course 2019 on 05 February 2019. Dr. Hasan Mahmud, MP, Hon'ble Ministry of information Inaugurated 'Education 4.0' in National Defence College on 24 January 2019. 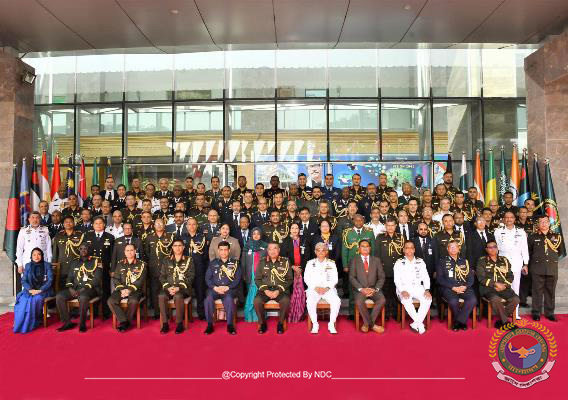 Officials from both military and civil services, course Members of National Defence Course 2019, Commandant, faculty and staff officers attended the event. National Defence Course is a multidisciplinary course tailored to suit the aim and objectives of the course. The 11 month long course is divided into four studies. Each study is 10 to 12 weeks long, concentrating on related key aspects. The theme moves from Bangladesh to global issues and to international relations. It focuses on analysis of Bangladesh’s National Security and a look into the future in the last study. Course curriculum include visits and tour programmes, designed to support the studies. NDC library is the nerve centre for all the college studies and plays an important role in promoting academic excellence. The Library subscribes many national and international journals, magazines and all major national daily newspapers. The Library preserves latest reports published by various ministries and departments of the Government. The NDC alumni Association comprises of all graduates, faculty members and staffs. The Alumni association seeks to connect / engage all NDC Alumni in order to foster a lifelong intellectual and social connection between the college and its graduates, faculty and staffs. NDC Forum is the web based application programme for intellectual members of the organization. National Defence Course is a multidisciplinary course tailored to suit the stated aim and the objectives. The 11 month long course is divided into four studies. Each study is 10 to 12 weeks long, concentrating on related key aspects. The AFWC curriculum is aimed at developing the thinking process of the course members towards planning and execution of warfare at the operational level. The course begins with studies on theories of war and operational doctrines followed by visits to different parts of the country. The Capstone Course on National Security and Strategic Studies at National Defence College, Bangladesh, is designed to enhance knowledge, skills and networks related to multilateral security cooperation in Bangladesh among senior law / policy makers, security- practitioners, judges, executives, civil society representatives, senior military officers, media personalities, entrepreneurs and other distinguished personalities of the society.